The Black and Yellow Argiope, or Writing Spider, (Argiope aurantia) is a commonly found orb-weaving spider. Orb weavers build the typical spiderweb with concentric rings that radiate out from the center. 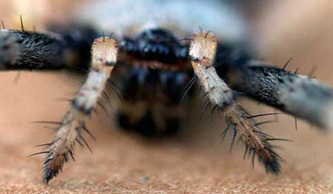 This is also the spider that was portrayed in the book and movie, Charlotte's Web. The Black and Yellow Argiope is often called a Garden Spider, but this is not a technically correct term, as the term Garden Spider is a common catch-all phrase used to refer to many different species of spiders. The most widely used common name for this spider is the Writing Spider, a name which comes from the distinctive zig-zag pattern that is weaved in the web. The silk that comprises the zig-zag pattern is of a special type that serves to attract flying insects (i.e. pollinators). It does so by mimicking the ultraviolet-reflecting markings found on the petals of many flowers. These markings are used by insects to point them towards the center of the flower, kind of like a road map, where the nectar and pollen is located. As you can see in the photos above, the ultraviolet-reflecting zig-zag pattern is pointing the insects not towards the center of a flower, but to a very large female spider. Some studies have shown that this ultraviolet web material also serves to prevent birds from flying through the web because they can also see in the ultraviolet range. Another species of Argiope, found in Australia, known as the St. Andrew's Cross Spider (Argiope keyserlingi) builds a pattern in its web, but the pattern for this spider is in an x-shape or cross-shape. If you would like to see a picture of this spider and learn more about it, click here. 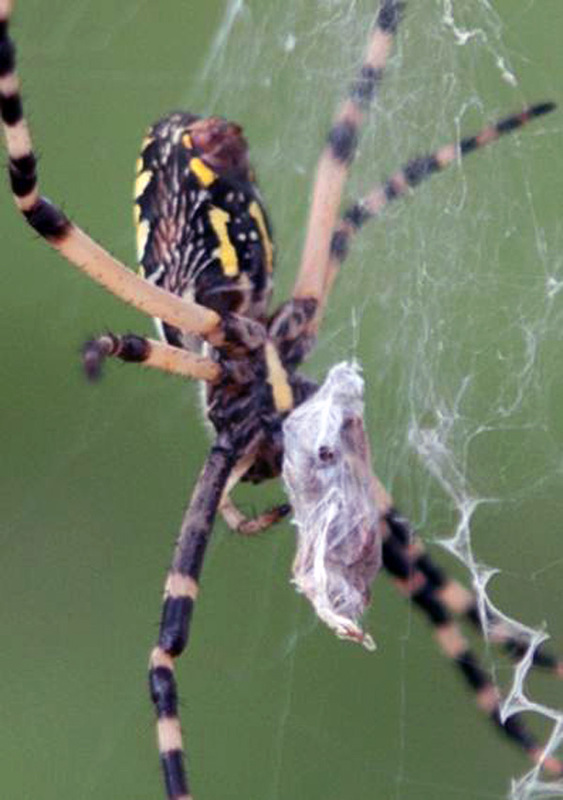 The female spider is much larger than the male, and has the commonly recognized black and yellow abdomen. The males are typically much smaller but have a similar color pattern. 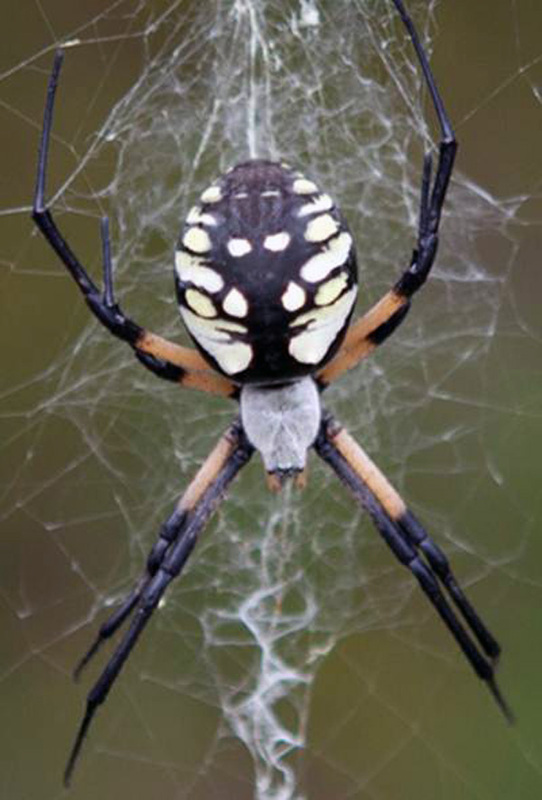 An interesting fact about the Black and Yellow Argiope is that if the female has not caught any prey in her web during the day, she will take the web down every night, digest its components, and re-weave another one for the next day. The female can be up to 3 inches in diameter (including the legs), and are commonly found in field edges where they like to build their webs between strands of fence wire. If you look carefully as you drive by wire fences in mid to late summer, you can often see more than one of these spiders along the fence row. While these spiders are large enough to bite, they are not poisonous to humans. Their venom is only poisonous to their prey. For more in-depth information, the University of Michigan has an extensive webpage on the Argiope species.